As a romantic suspense writer, I find myself writing about topics that I know nothing about. But that’s probably a good thing! I never want to experience a sniper attack, my cabin blowing up with me in or near it, or be anywhere in the vicinity of a gun battle. Thank heavens I love research. It’s essential for a good romantic suspense novel to have well developed characters and strong conflict, but meticulous research is what makes the suspense element believable. The foundation of my stories is in watching my hero and heroine fall in love on the page. Building the suspense element around that romance is where the fun begins. The Shadow series is about five brothers who live and breathe law enforcement. I spend the better part of my days reading about the federal government and local law enforcement cases and activities, and interviewing people I know who are closely involved with criminal justice. I know nothing about being a cop or a F.B.I. agent, and at fifty-five years of age, it’s not going on my bucket list. Thankfully, I have great friends who do work in those very noble fields who point me in the right direction. When you write about men whose credo is to protect the innocent, it’s important to understand a little about the weapons they carry. I have always hated guns and have spent my life avoiding everything about them. Lately, an alien has taken over my body and I’m all of a sudden fascinated by guns. I read articles and watch endless YouTube videos about anything from the different types of weapons available, to how to take them apart, to what sounds different weapons make when fired, to the distance different size bullets travel, and the damage a bullet can do to the body. It’s unnerving to consider what’s out there, but that information fuels my imagination, turning my novels into nail-biting page turners. I love paring my strong hunky McNeil brothers to strong, independent women. While I do consider myself a strong woman, I create women who are nothing like me. Take for instance my heroine of In the Shadow of Greed. Dr. Sarah Tu is a world renowned cryptologist. If I was forced to sit down and take a basic high school algebra test, I would flunk it with flying colors. How did I make that character believable? I researched every article I could find—and understand—about cyber security, botnets and cyber crime. In my newly released book, In the Shadow of Malice, I wanted my hero to take a loaded weapon out of my villain’s hands while facing him. I have seen that move on the big screen, but was it actually possible? I couldn’t believe the number of self-defense videos that demonstrated the technique. It’s not something I will ever try, but it was a blast writing the scene into the story. With my work in progress, In the Shadow of Pride, [Summer 2014] I’m buried under the research on drone technology. I can’t wait for everyone to see what happens when I place a drone in the wrong hands. As you can probably guess, my best friend these days is the Internet. I can spend hours researching a concept and end up using only about a paragraph of that information in the story. But that is research and I found it to be one of the best things about being a romantic suspense writer. With all that said, I have been known to fluff the research a little so it works in my story. I hope my readers will forgive me and enjoy the story anyway. Nancy will be giving away one ebook, winner's choice from the Shadow series, In the Shadow of Greed, In the Shadow of Evil or In the Shadow of Malice. Your search history must be an interesting one. I do appreciate a story where the author has done his/her research and the story comes alive for me. Thanks so much for stopping by. The Internet makes research so easy these days. The only thing I worry about is the real men in black suits showing up at my door one day because of the things I Google. LOL. Nancy, I love learning about other authors' research techniques - and what they're working on right now. Do you ever wonder (in your darkest moments) if anyone at one of the national security agencies notices what you're looking at online? At the moment, I'm researching pubs in London circa 1947, so I think I'm safe. :) Much continued success with your excellent series! Good for you, Nancy, getting so involved in the research. No only does the right information make a tale realistic, it also sounds as though you're having a great time. Much continuing success. Thank you! If is amazing what a few years make in maturity. I remember back in high school, just the thought of research sent me into a tailspin. I really appreciate you stopping by. We readers get to enjoy the finished product, but I am always amazed by how much time, talent, and research go into creating a story... to make the characters come to life for us between the pages of a book. Thank you so much for sharing... Congrats on your new release! Thank you. I use to believe that authors were just brilliant. How could they not be? But now that I call myself one, I realize that they are probably just like me. If I limited my stories to only what I knew and experienced, boy would that be a boring story. I find that creating interesting characters and making them function in the world I have created-- through a lot of research---is almost magical. Thanks so much for dropping by. Nancy, I always appreciate an author who takes the time to do the research needed to make a story believable. Doesn't mean you have to bury yourself in it, but it really does make a difference. Best of luck with the release, and the series! Sometime the topics I take on, like computer malware [botnets] are so out of my expertise, that it really does feel like I'm buried under a mountain of research. Eventually, everything begins to click and my imagination takes over. Thank you so much for dropping by for a visit. I can't wait to see your new novel, In This Life released. Fantastic cover! 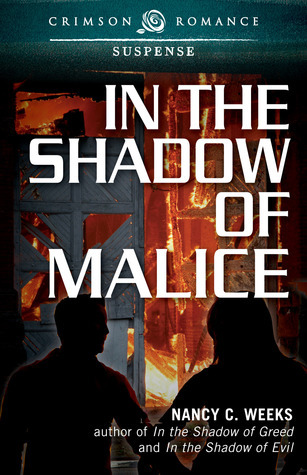 Absolutely enjoyed In the Shadow of Malice! Can hardly wait for the next book in the series!!! Thanks for dropping by. I'm so pleased you enjoyed In the Shadow of Malice. The next book comes out sometime in July 2014. Thanks for sharing. Glad I'm not the only one who watches videos and does crazy research stuff like ride a Ducati motorcycle or fire a machine gu. Still trying to get invite to hang out with Spec Ops guys but at least I have some who answer questions. Best wishes with your new book. Keep having fun with your research. You sound like you have MORE fun than I will ever have. I hope you get your chance to hang with those hunky, real-life heroes in Spec Ops. Boy would I like to peek at those notes. Thanks so much for coming by. HUGS! Thanks so much for stopping by to check me out. I would love for you to win one of my books from the Shadow series too. Fingers and toes crossed! Great post Nancy. I'm not a fan of doing research but you make it sound so exciting. I think you may have turned me around! So nice to see you here. I have to say that my teachers in high school would be shocked at my new found love. The research would be fascinating. I could see myself getting side tracked all over the place.